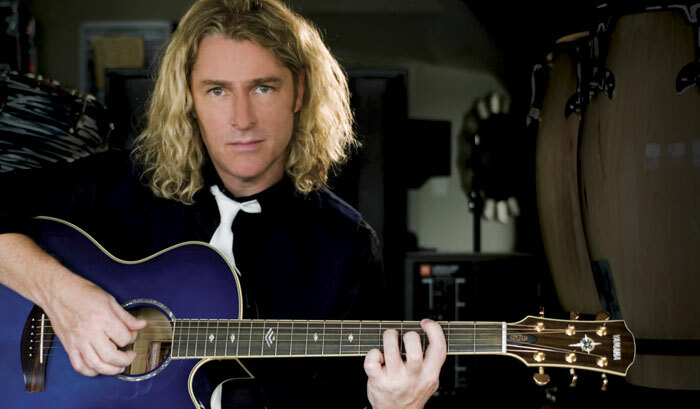 It's been more than 15 years since Collective Soul wowed the music world with Hints Allegations and Things Left Unsaid, a debut that spawned seven hit singles, including the modern rock classic "Shine." Now the band is back in the studio completing an as-yet-untitled eighth album that Ed Roland, the band's singer and principal songwriter, promises will resonate with fans of that breakthrough disc. "Our longtime fans will really appreciate it," says Ed. "It was fun experimenting with loops and things like that on our last few albums, and I appreciated the guys letting me explore the '80s influences I grew up on. But now we're going back to the basics. The sound is more basic. More rock. More riffs." We tour a lot, and that guitar has really hung in there. It's, like, my little baby blue! Ed, who plays guitar and piano, caught the songwriter bug early on. "I'm from a small town in Georgia. My dad was the town minister, but he was pretty hip. He took me to my first concert: Johnny Cash. He took me to everything from Liberace to the Kinks. He was very supportive of my music, and always wanted me to do what I loved." One life-changing inspiration was Elton John's Greatest Hits. "Elton looked so cool with his white hat and white suit," Roland recalls. "As soon as I put that record on, I wanted to be a songwriter like Elton and Bernie Taupin. But I never planned to be a singer--that just happened because nobody else around me would sing. I finally said, 'Okay, I'll do it.'" Ed's first quality guitar was a Yamaha SG2000. "That's what everyone I liked played back in the '80s," he says. "Duran Duran. Big Country. It's such a cool guitar. It's one big, solid piece of wood, and it sustains forever. Unfortunately, mine got stolen. For all these years I wanted another one, but they were hard to find." So Ed was delighted when Yamaha reissued the guitar as the SBG1000 and SBG2000. "It's like I got my old guitar back," he says. "That black SG2000 I loved." Roland also plays a Yamaha CPX900 acoustic. "Oh, I love that thing," he says. "First, I love the blue color. But you can't go by color alone--you've got to play it. The tone is amazing, and it's so durable for live playing. We tour a lot, and that guitar has really hung in there. It's, like, my little baby blue!" Right now Ed is holed up in the studio with two of the band's original members--his brother, guitarist Dean Roland, and bassist Will Turpin--and two relative newcomers, lead guitarist Joel Kosche and drummer Cheney Brannon. "My studio is in my home on a lake," he says. "Once everybody gets there, they realize there's nowhere to go. So we wake up, we work till we're tired, we go to sleep. It's the fastest record we've ever made. We're about 70 percent done, and we're very excited." 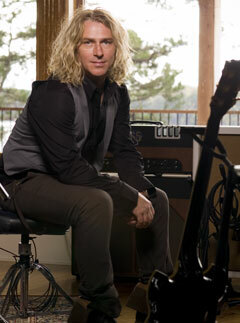 Ed originates nearly all Collective Soul's songs on piano or acoustic guitar. He crafts chords and vocal melody, but leaves the lyrics open. "I start with what I call a 'vowel movement,'" he explains. "Just a rough part that marks out the melody and rhythm and rhyming scheme. It's like speaking in tongues." Next, the band works on the arrangement. "We usually start with just drums and bass, working out the groove," says Ed. "Joel, the lead guitarist, sits back and feels out where it's going, what space he has, where he can fill in. Each guy arranges his own part, but since we're a song-based band, they try not to take away from the melody." But this time around, there was a departure from the band's usual procedure: They created a song from start to finish as a group. "It's the first time we've ever done that," Ed says. "The song is called 'You,' and out of all the new songs, it may be the one I'm most excited about. It was a very fun and exciting way to work, and I think a lot more are about to happen that way." Ed finds it difficult to single out a favorite Collective Soul album, though he admits a special fondness for 1999's Dosage. "Maybe that's because a lot of young bands I meet these days tell me how much it influenced them. They say it reminds them of their youth." He laughs. "It's funny that you can stay around so long that you're actually starting to remind people of their youth! It makes you think, 'Hey, if I've hung around this long, I've done all right!"